A rant about girls and sport in Britain. My daughter was in reception when we got the flyer about football sessions on Saturday mornings in the park. I got excited; my eldest daughter loves running around outside and has a competitive streak, this would be perfect for her. We bought tiny shin guards. We turned up, with a couple of her (girl) friends and their mums. Everyone else there, including the instructors, was male. Molly did one session and told me she wasn’t going back. Neither of the other girls wanted to stick with it, either. It’s possible they just didn’t enjoy it, which is fair enough. But I’m pretty sure that at least some of their reluctance came from the message they picked up loud and clear beneath our encouraging pep talks: this was not the place for them. Where were the girls? Girls spent Saturday mornings swathed in pink, twirling in a ballet class, or maybe in gymnastics. But not on a muddy pitch running about with boys. When I was a girl I played soccer with girls and boys. I played baseball (see above) and pickup ice hockey, spent afternoons shooting baskets and roller skating. I grew up in America, in the golden age of Title 9, and I enjoyed sports, though I wasn’t good at them or considered “athletic.” In high school, I became one of the arty kids with too many rehearsals after school to go out for the cross country team, which I still regret. 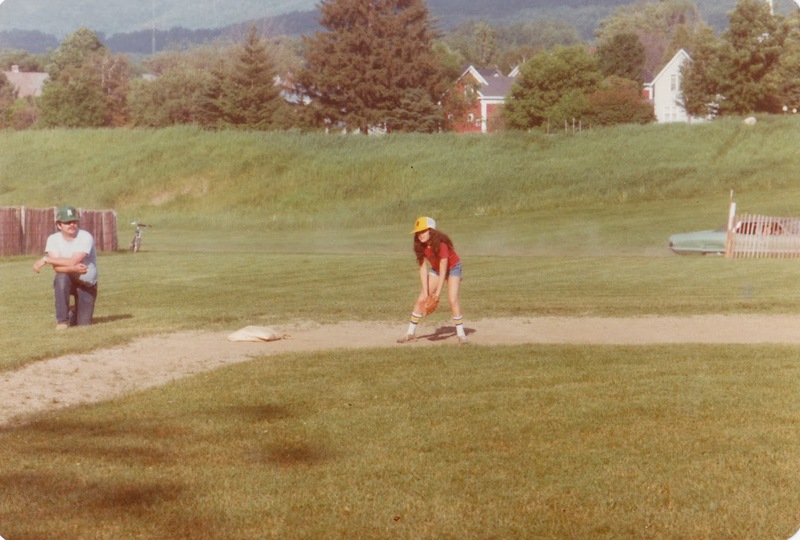 But in college, I rediscovered sports, playing intramural women’s soccer very badly but with great gusto. Since then, I’ve been as active as time allows, running and doing excercise classes. I do miss those things you only get from competitive team sports – the companionship, the spirit and the collective drive to win. For girls to feel comfortable doing sport, they need to be shown that it is theirs as well – and if it takes girls-only football clubs, then that’s what we should give them. So I ask. There is some funding available for girls’ football clubs, I am told by one of the organisers of the boys’ sessions, but no girls seem interested. No one is bothering to try and get them interested, I point out. I offer to hand out flyers at the local schools for a girls-only session and help out with organising, but I am politely rebuffed. I live in Bury, where Sport England is spending £2.3 million on a big campaign, I Will if You Will, aimed at getting women active, and it’s fantastic to see all that’s on offer for us. But if girls don’t learn to love sport when they are young, teaching them to be active as adults will remain an uphill battle. I feel bad for Sport and Equality Minister Helen Grant, who responded to a question that reflected some unappetising but very real pre-conceptions about sport, and promptly had her head bitten off, with commentators up and down the land quoting her out of context. It’s facetious to pretend that there isn’t something very wrong with women’s sport in this country, whether you like it or not. But it’s a very welcome conversation to be having, the columnists say – maybe now people will start taking women’s sport seriously in Britain. Yeah, okay. Maybe now, they said, every time a women’s football or cricket team did well in international competition. Maybe now, they said, when female athletes won 22 medals for Team GB at London 2012. Maybe now, they’re saying at this very moment, as women have won three quarters of the medals at Sochi. While we wait, another generation of girls is learning that football is for boys. Another generation of girls is learning to value their bodies only for their visual appeal, not for their strength. Another generation of girls is growing up without learning the pleasures of physical activity, without building habits that will prolong their lives. Another generation of British girls is growing into women who will buy pretty pink ballet outfits for their little girls and football shoes for their little boys. Apparently, it’s already too late for my daughters.